Last Week in Review: Fed Funds Rate increases 0.25 percent, while wholesale inflation and Housing Starts heat up. Forecast for the Week: Housing news will dominate. View: Tips to help make your clients your personal marketing team. When the Fed expectedly raised its benchmark Federal Funds Rate 0.25 percent at its March 14-15 meeting, Stocks and Mortgage Bonds both improved following the news. The Fed‘s tame read on inflation and its decision to maintain its balance sheet of existing Mortgage Bonds helped Bonds rally. Meanwhile, Stocks responded favorably to the news that the Fed is planning two additional hikes this year, eliminating some uncertainty. The Fed Funds Rate, with a new target rate range between 0.75 to 1.0 percent, is the rate at which banks lend money to each other overnight and is not directly tied to consumer products like purchase or refinance home loans. Instead, home loan rates are tied to Mortgage Bond market performance. Home loan rates can move lower when Mortgage Bonds improve and vice versa. There was good news from the housing sector, as the Commerce Department reported that Housing Starts hit a four-month high, rising 3 percent from January to February to an annual rate of 1.288 million. Housing Starts measure when excavation begins on a new home. Starts on single-family homes rose to a near 10-year high. 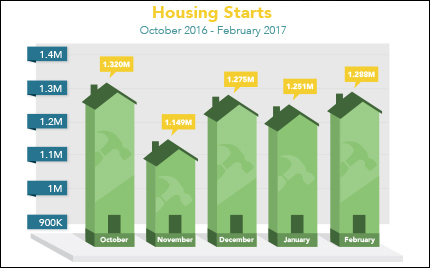 From February 2016 to February 2017, Housing Starts were up 6.2 percent. The increase is a welcome sign for those in the market for a home as limited inventory has driven home prices up in many areas, discouraging some buyers. Another welcome sign: The National Association of Home Builders reported that its Housing Market Index, a measure of home builder sentiment, jumped six points to the highest level in 12 years! In economic news, wholesale inflation came in hotter than expected in February, with the year-over-year Producer Price Index reading reaching 2.2 percent, the highest since March 2012. The Consumer Price Index was in line with expectations, falling in February from January to 0.1 percent due in part to lower gasoline prices. Retail Sales also met expectations, though they did decline from January. For those in the market for a new home or a refinance, home loan rates remain attractive. Housing news dominates the week. Will the positive momentum continue? Housing data kicks off on Wednesday with the release of Existing Home Sales, followed by New Home Sales on Thursday. The week rounds out with Durable Goods Orders on Friday. As you can see in the chart below, Mortgage Bonds experienced a nice rebound following the release of the Fed‘s monetary policy statement. Home loan rates remain in attractive territory. Identify your best clients. Send a short email to your database and ask one question: “On a scale of 1-10 how likely are you to refer us to someone you know?” Then, send a Google My Business review link to those clients who respond “9 or 10 highly likely to refer” and request they leave a review. Make this strategy part of your follow-up with new clients to keep your “9 and 10” database growing. Ask for an intro. Public speaking events and seminars at local organizations are a great way to build local business, and if one of your best clients is part of the organization and introduces you before you speak your credibility will soar. Let your clients know in follow-up marketing that you are available to speak about local trends in your industry. Host a client appreciation event to deepen relationships with past clients and cement newer ones. Encourage attendees to bring a friend. Events might include a tasting, cooking class, barbeque, movie night, holiday theme and family board game night. Go the extra mile for your best clients. Call them on their birthday or even send them a cake. They may snap a photo and post it on their social media sites so they can thank you, which could lead to referrals among their friends and family. These simple ideas can help turn your best clients into your best marketers!